Do you have a student that is your puzzle child this year? You know there is an issue with him or her, but you can’t seem to put your finger on what that is. When we teach reading we teach our students to find just right books. Up until now, you haven’t been able to find the just right label of what is happening with this student. He or she may have some characteristics of autism, ADHD, or other labels but these are not a perfect fit. Although we know a student is more than a label, we need the label so we’ll know what strategies to use to help him or her reach his/her full potential. A few years ago I had a student that was my puzzle kid. His previous teacher spoke to me before the year began about her observations. She knew there was an issue but wasn’t quite sure what it was. I soon saw what his previous teacher observed the year before. Anytime my students worked in small groups, there was friction with his group. It didn’t matter how many students I put in his group or who was in his group, at some point I knew a student from his group would be reporting to me that there were problems. My SLP stopped by to see me one day about another student during center time. One of the students from his group reported there were problems (again). My SLP began to watch the group. She thought the issue might be pragmatic language disorder. I spoke to the parents about having him tested for this and they agreed. He was tested, diagnosed, and received support that year. Within a few months of support the dynamics of my center time completely changed for the better. My SLP was my new best friend! 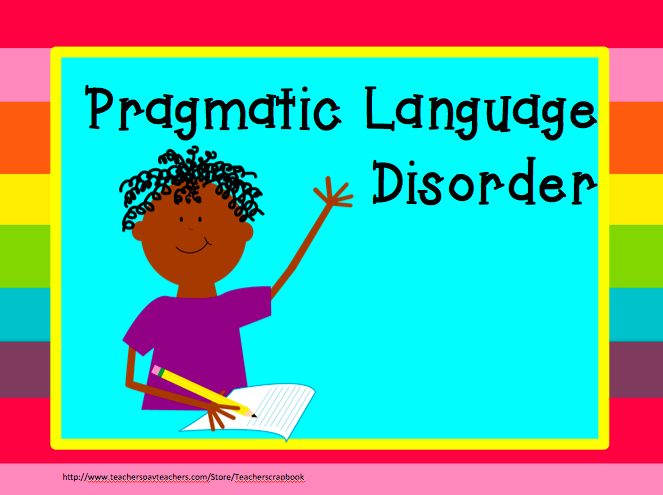 Does your child have pragmatic language disorder? Oh my gosh! I haven't heard of this, but it sounds like a little girl in class this past year. Definitely going to remember to share with her next teacher. Very Nice info, u shared here.thanks for it. Sounds like a student I had this year. What kind of support did he receive? What kind of things helped? My student received support from the SLP and also received counseling. They worked on things like looking at pictures of facial expresisions and learning what they mean. He was also in a group with other students who need guidance with their social skills. They did a lot of role playing, too. I am little confused by your first link…it goes to Reading Rockets. Can't really find where you are finding the info about the pragmatic language disorder. However the others were very helpful, I have a student who this describes perfectly. WOW! I had no idea there was such a thing. Thanks for the helpful information. I will keep that in mind. I believe the term is Mixed Expressive Receptive Language Disorder (MERLD) otherwise known as Language Disorder.